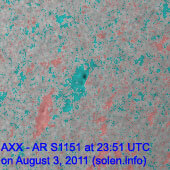 Last major update issued on August 4, 2011 at 06:15 UTC. 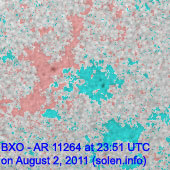 The geomagnetic field was very quiet on August 3. Solar wind speed ranged between 317 and 366 km/s. 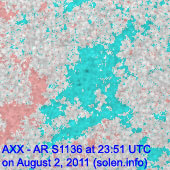 Solar flux measured at 20h UTC on 2.8 GHz was 119.9 (increasing 34.4 over the last solar rotation). The planetary A index was 3 (STAR Ap - based on the mean of three hour interval ap indices: 2.8). Three hour interval K indices: 10001111 (planetary), 10012311 (Boulder). Region 11260 was quiet and stable. 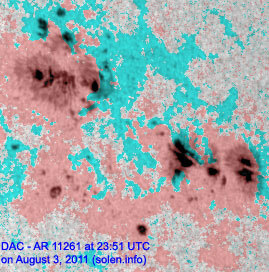 Region 11261 has a strong magnetic delta structure in the central penumbra. An elongated negative polarity umbra has positive polarity neighboring spots both to the north and south. There's virtually no umbral separation in the northernpart of the magnetic delta, thus creating very strong gradients. 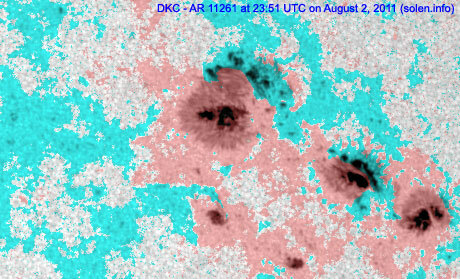 As long as this structure remains the region will continue to produce major flares. Flares: M1.1 long duration event peaking at 03:37, C1.1 at 06:46, C8.7 at 07:58, C1.0 at 10:04, major long duration M6.0/2B event peaking at 13:48 (associated with type II and IV radio sweeps and an Earth directed CME), C8.5 at 19:30. 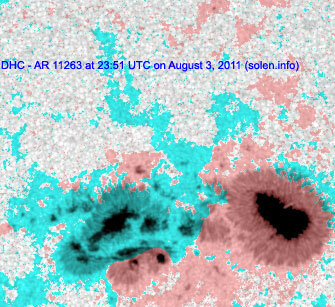 The region was the source of a major M9.3 event at 03:57 UTC on August 4 (associated with a fast full halo CME). 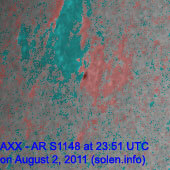 August 1: No obviously earth directed CMEs were observed. August 2: An Earth directed CME was observed in LASCO and STEREO images after the LDE in region 11261 peaking at 06:19 UTC. 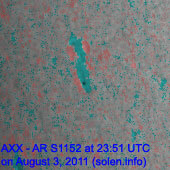 This CME will likely reach Earth sometime after 09h UTC on August 4. 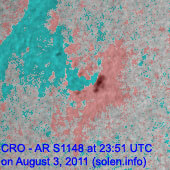 August 3: A full halo CME was observed in LASCO and STEREO images following the M6 event in region 11261 at 13:48 UTC. The CME coudl reach Earth on August 5. 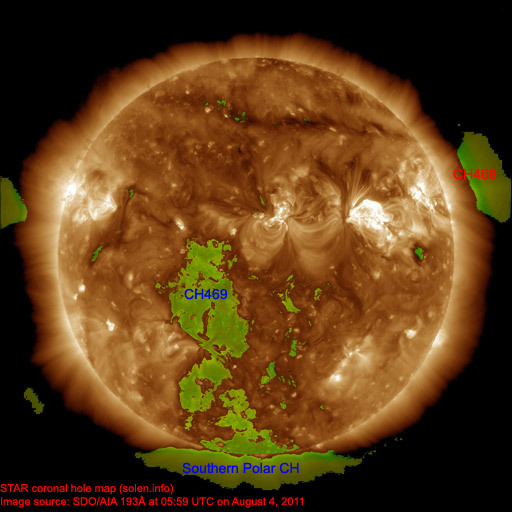 A recurrent coronal hole (CH469) trans equatorial coronal hole will be in an Earth facing position on August 3-4. 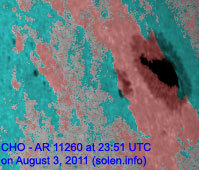 A poorly defined coronal hole (CH470) was Earth facing on August 2-3. 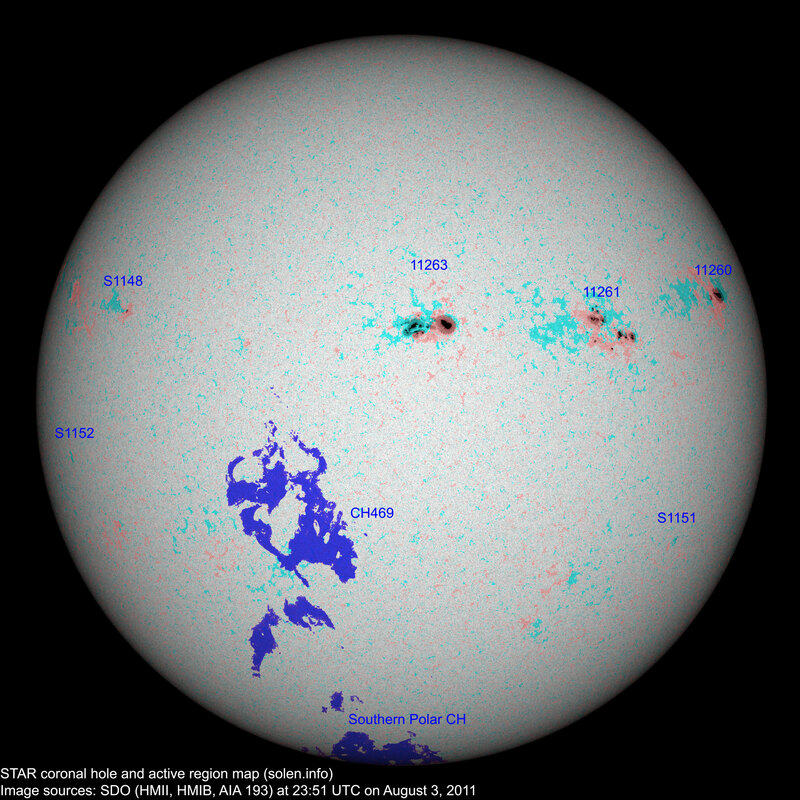 The geomagnetic field is expected to be initially quiet on August 4. A CME impact is likely during the latter half of the day with a possibility of active to major storm conditions. 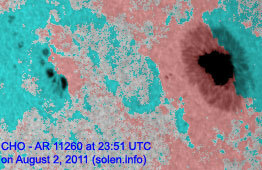 Another CME impact is likely on August 5 (related to M6 flare). A large CME associated with the M9 event on August 4 will likely reach Earth on August 6 and cause active to major geomagnetic storming.